One of the large regional orchestra in the United States, Richmond Symphony is playing Dewa Alit's "Open My Door" written originally for Ensemble Modern in Frankfurt in 2015. Gamelan Salukat at Solo International Gamelan Festival, Java! Gamelan Salukat has give the opportunity to perform at the special stage of the closing ceremony of 8-day International Gamelan Festival in Solo! Dewa Alit has prepared a new work with for Salukat musicians on Javanese gamelan specially for this occasion. Salukat's stage is schedule for 19:00 for 30 mins during the ceremony. Gamelan Salukat at Rudolstadt Music Festival, Germany! 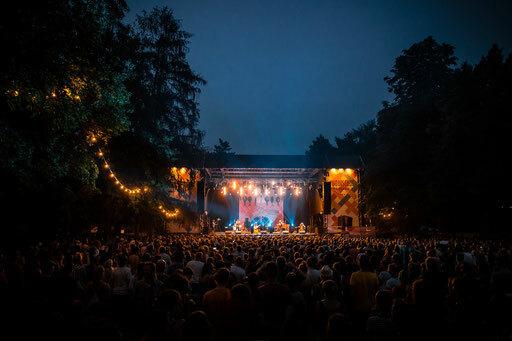 the last destination of Salukat's Europe Tour 2018 is agian in Germany, this time at the falkmusic music festival in Rudolstadt, Germany. 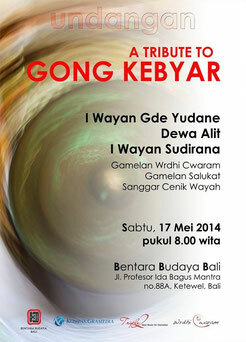 here, again, we are bringing some traditional repertoire of kebyar style, as well as Dewa Alit's contemporary pieces. event detail is available at Rudolstadt Festival official website. Gamelan Salukat at Roskilde Festival, Denmark! one of the highlight of Salukat's Europe Tour 2018 is our performance at the biggest rock music festival in the north Europe, Roskilde Festival! event detail is available at Roskilde Festival official website. Gamelan Salukat at SommarScen Music Festival in Malmo, Sweden! as our part of Europe Tour 2018, we are going to perform at SommarScen Music Festival with both traditional and contemporary repertoire, including Dewa Alit's Gringsing with new legong coreograph and The Land is Talking. Gamelan Salukat will be at International Gamelan Festival in Munich, Germany, from 8 to 17 June, 2018. During the festival, Gamelan Salukat will perform a few stages among several other gamelan groups both from Indonesia and outside Indonesia, which includes an experimental performance of Dewa Alit's composition for gamelan and the carillon at Mariahilfkirche church in Munich. The festival is also hosting a series of symposium by acknowledged scholars and musicians in gamelan, where Dewa Alit is giving a short talk on his experience with Western music. Dewa Alit with Gamelan Galak Tika at MIT Boston. Program will feature Gamelan Anak Tika (Cambridge Youth Gamelan) celebrating the end of their second season as well as the WORLD PREMIERE of Dewa Alit's "AMERIKI" for Lou Harrison's legendary "Old Granddad" instruments, flute, and piano. Program will also include performances of traditional Balinese dance and additional music composed by Dewa Alit. Ruang Suara is back! Dewa Alit with Ensemble Modern Frankfurt will be at Holland Festival 2017. Dewa Alit and 5 other Indonesian young composers with Ensemble Modern are going to perform their works from Ruang Suara Project at Holland Festival in Amsterdam. 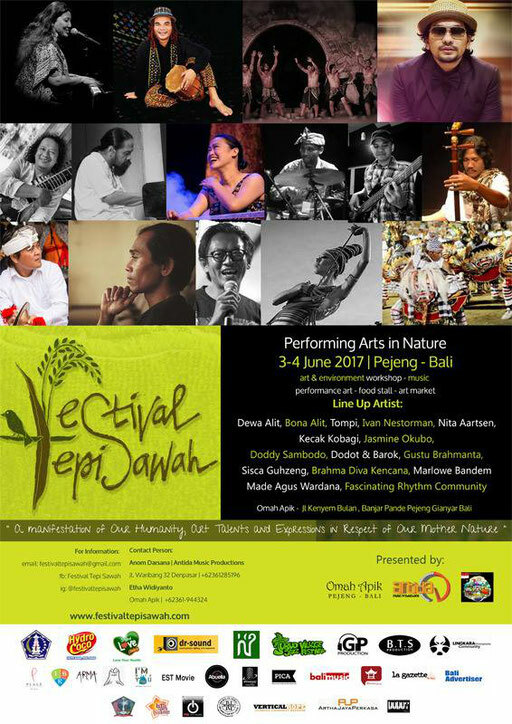 Gamelan Salukat will be at Festival Tepi Sawah, Performing Arts in Nature, playing Dewa Alit's works including the latest piece, "Memedi". Gamelan Galak Tika will perform new music by Guest Artistic Director, Dewa Ketut Alit, as well as a selection of traditional Balinese music and dance. Dewa Alit & Gamelan Salukat at “New Music for New Gamelan” series @ Bentara Budaya Bali. 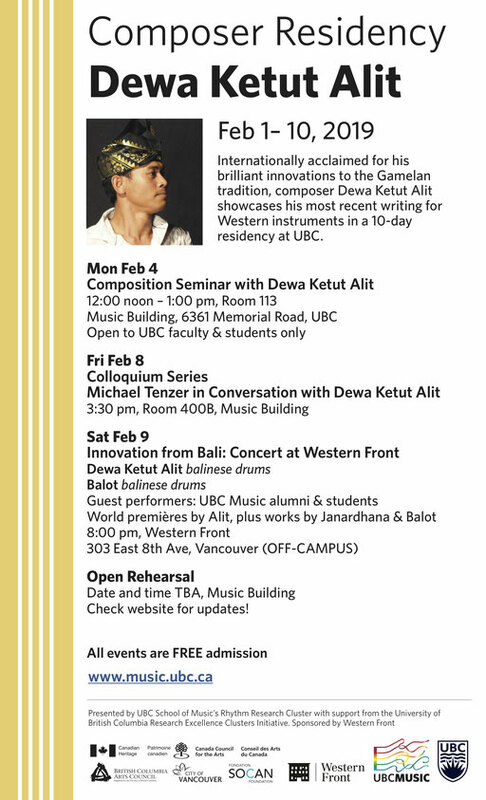 Bentara Budaya Bali’s monthly demo-discussion series for new music is featuring composer Dewa Alit this month, in which Gamelan Salukat will be playing Dewa’s newest composition “MEMEDI” for the first time. Dewa Alit in Gamelan Galak Tika's spring concert! Under the direction of Dewa Alit, the gamelan will perform Evan Ziporyn's Tire Fire, and other traditional and modern music for gamelan gong kebyar. There will be also a short outdoor performance of highlights perior to the concert on the same day as part of the MIT Open House. 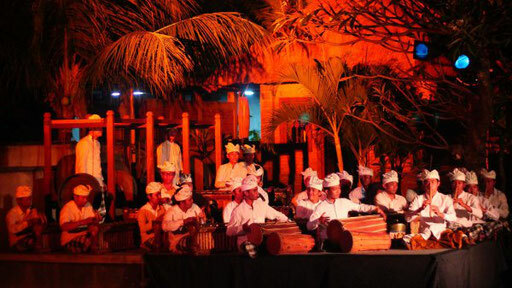 They will also demonstrate how to play gamelan instruments in a fun, hands-on, and interactive workshop. No prior musical experience necessary. 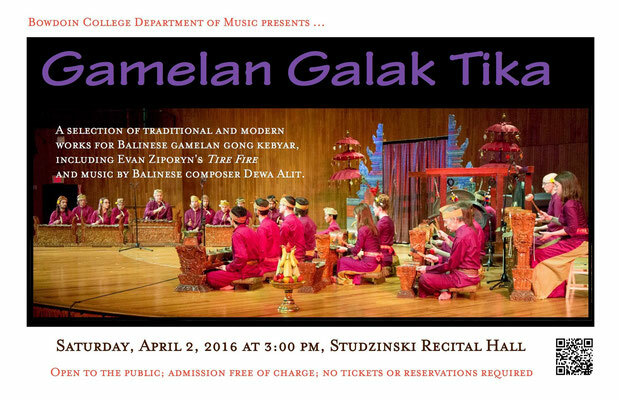 First concert this sesason while Dewa Alit is with Boston's Gamelan Galak Tika! The program includes Evan Ziporyn's iconic work, Tire Fire, as well as music by Dewa Alit, and traditional gamelan gong kebyar dance pieces. our CD store is now open! now you can purchase Dewa Alit's music CDs online from our site! finally, we have opened our online shop for our CDs! please check our online shop here. we ship worldwide with a $3.50 flat shipping/handling fee per order. for now, orders are shipped from Manohara Co.,Ltd, Japan, as the delivery would be much cheaper, faster and safer this way than from Bali. Hiromi from Manohara has generously agreed to help us for a very small fee in order to support Gamelan Salukat. Thank you, Hiromi! for shipping within Indonesia, please contact us via email or from the contact form on this site. Dewa will be in Boston again for MIT spring semester 2016! There will be some concerts during his residency, information will follow. Dewa Alit's long-awaited, newest CD has come! This CD includes two compositions. 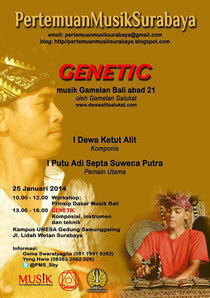 "Genetic" is a piece Dewa composed around his own interpretation of the scientific and natural phenomena of DNA into the life of music from traditional to contemporary, featuring the full-set emsemble, Gamelan Salukat. The composition itself was finished in 2012. "Land is Talking" is a collection of 5 short pieces through which Dewa hopes to convey the sad and angry voices of the land that are being over-developed for new hotels and restaurants in Bali. 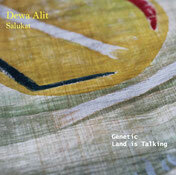 Dewa Alit's second CD from Gamelan Salukat is now available. please contact us for purchase at <info@dewaalitsalukat.com>. Ensemble Modern, Frankfurt, is coming to Indonesia and will play Dewa Alit's work for Ruang Suara project in 3 cities in Java. 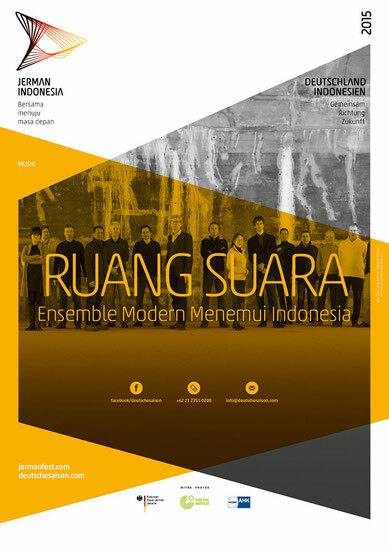 Dewa Alit has been selected as one of the 8 Indonesian composers for Ruang Suara project with Ensemble Modern, Frankfurt, one of the world's leading ensembles for contemporary music. Dewa Alit's 15-min piece for EM entitled "Open My Door" will be performed by the ensemble in the concerts. 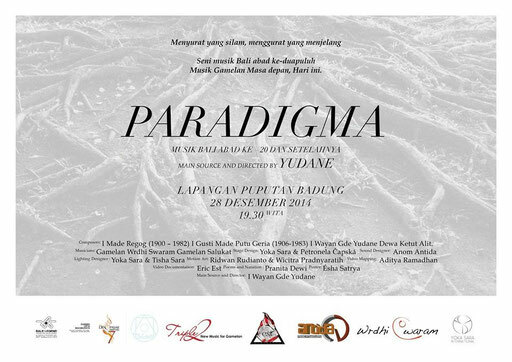 Ruang Suara is a joint project of Ensemble Modern, the Foundation KfW Stiftung and the Goethe Institute in Indonesia. Ensemble Modern, Frankfurt, is going to play Dewa Alit's work for them in the concert for Ruang Suara project. Dewa Alit's 15-min piece for EM entitled "Open My Door" will be performed by the ensemble in the concert. 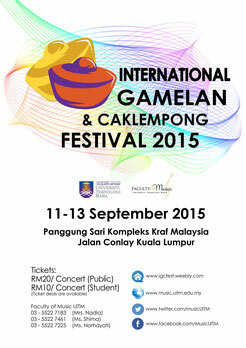 Dewa Alit and Gamelan Salukat is playing again at International Gamelan & Caklemnong Festival 2015, Luala Lumpur. 8 players from Salukat are presenting Dewa Alit's new composition "Tanah Sedang Bicara." Riley first came to MIT in 2011, when Gamelan Galak Tika premiered his White Space Conflict for gamelan and electronics. This year MTA and CAST celebrate Riley’s 80th birthday with a concert spanning the depth and breadth of his work and influence. 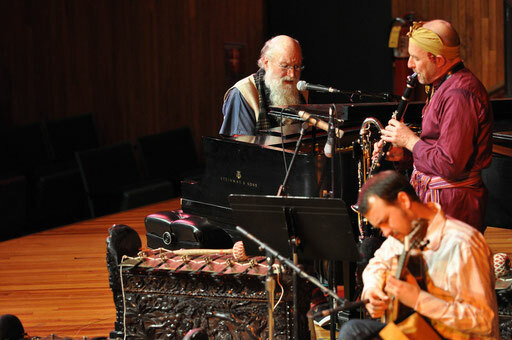 The concert includes new works commissioned and performed in his honor by pianist Sarah Cahill; first-ever improvisations by Riley & Eviyan (featuring Iva Bittova and Gyan Riley), a spectacular multi-saxophone version of the classic Poppy Nogood, and a reprise performance of White Space Conflict. 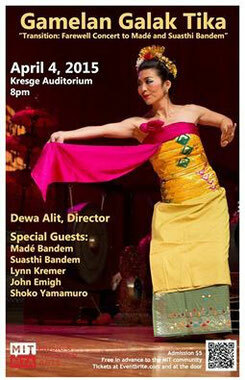 Dewa Alit is performing with Gamelan Galak Tika, Boston, in their spring concert featuring US PREMIERE of Dewa Alit’s “Batu Kalian” and Bali's master dancers Made & Suasthi Bandem. Gamelan Galak Tika celebrates the artistry of master Balinese dancers Made Bandem and Suasthi W. Bandem with a farewell performance before their return to Bali after an 8 year residency at the College of the Holy Cross. The performance includes Puspanjali (1988), choreographed by Suasthi Bandem, in addition to a full Topeng Pajegan - Balinese masked theater - featuring guest dancers Made Bandem, Suasthi Bandem, Lynn Kremer, John Emigh, and Shoko Yamamuro. The performance will also include the North American premiere of Batu Kalian (2013) by guest artistic director, Dewa Alit, and Robin Buyer's Monkey House (2014). 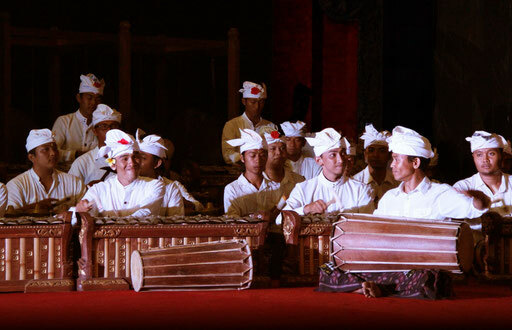 Gamelan Salukat is performing at Denpasar Festival! Don't miss Gamelan Salukat's last performance for 2014! Salukat will be performing a piece Dewa composed specially for this program cerebrating the works of one of Bali's great composers, late Pak Regog. Dewa Alit is writing a piece for Talujon Percussion's new "Pocket Gamelan" project. Described by the New York Times as an ensemble possessing an "edgy, unflagging energy", Talujon has been mesmerizing audiences since 1990. Talujon is thoroughly committed to the expansion of the contemporary percussion repertoire as well as the education and diversification of its worldwide audience. Over the past 20 years, Talujon has commissioned dozens of new works for percussion quartet. “Pocket Gamelan” is an evening-length show presented by Talujon percussion sextet which features newly commissioned works by American composers Glenn Kotche and Nick Brooke, choregraphy and performance by Mugiyono Kasido, and a new work by Dewa Alit, a leading experimental composer from Indonesia. The multimedia program re-imagines the gamelan as a makeshift and dynamic instrumentarium, comprised of parts gathered from the surrounding environment. see detail at Talujon's website! Gamelan Salukat is presenting a part of Dewa Alit's one of newest compositon "Tanah Sedang Bicara" at "A TRIBUTE TO GONG KEBYAR." Gamelan Galak Tika concludes 21st season with WORLD PREMIERE of Dewa Alit’s “TechnoGong” for electric gamelan ensemble! 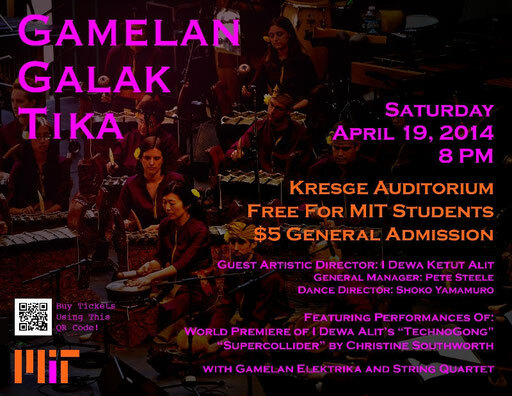 Cambridge, MA (April 19, 2014) – Gamelan Galak Tika presents the world premiere of TechnoGong, a new piece for electric gamelan by guest director Dewa Alit, one of Bali’s most innovative composers. The concert will also feature Alit’s award-winning Caru Wara, Christine Southworth’s Supercollider (for electric gamelan and string quartet), Sam Schmetterer’s It’s About Time, and traditional Balinese dance, performed by Sachi Sato. 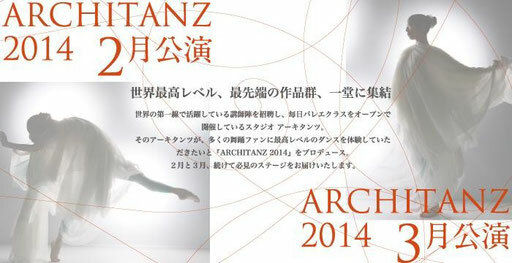 The performance takes place on Saturday, April 19, 2014, 8 PM at MIT’s Kresge Auditorium, 48 Massachusetts Avenue, Cambridge. General Admission is $5; free (in advance) with MIT email address. Tickets are available at http://mitmta.eventbrite.com/ and at the door. Dewa Alit is going to be in the east coast US again this year! For mid-February - mid-May 2014, he will be in Boston and NY, working with Gamelan Galak Tika MIT, Yowana Sari Queen's College NY and Gamelan Dharma Swara NY. Concert schedule will be available later.